We all have habits; many are automatic and beneficial, but some are not helpful, even negative. Your brain performs many complicated, multifaceted functions and assigns many activities to autopilot; such as biological and physical functions—like breathing and digesting food. This allows your brain to efficiently perform ingrained operations at the subconscious level to work on more complex decisions. Once you select to do certain things or adopt a particular attitude time and time again, it becomes habitual behavior. If your selections are helpful and satisfying; great. If you determine your situation needs to change or circumstances are detrimental to your well-being, you can begin the process of breaking a bad habit. Your mind and willpower can overcome obstacles and habits that are keeping you from achieving success or making desired changes. Each day your mind leads you in a certain direction – sometimes by choice and other times in ways you don’t expect. You forge through your daily activities mostly by the habits you’ve formed – such as brushing your teeth or having a cup of coffee. When you learn how to control the mind, it can be a magic potion in determining your success in anything you want. Good and bad habits run your life, and you can create more good habits than bad if you find ways to engage your mind. It’s not as easy as it might seem. The subconscious mind that you don’t control has much to do with approving or sabotaging your good habit resolutions. Chronic bad habits can hold you back professionally; affecting your health and relationships with others. There's no quick fix. It takes work to identify bad habits and replace them with new and better habits. It takes disciplined commitment. Try regularly imagining the positive outcome of your desired change. Determine what you’re getting from the practice. You must understand the bad habit before you can conquer it. Identify the perceived benefit you derive and the negative impact. Good habits need to be formed to break the old ones – such as a hobby to replace a spending habit. How are you sabotaging yourself? 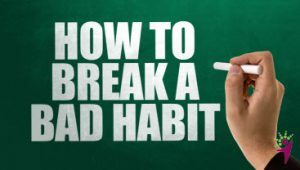 Many bad habits are not broken because you unintentionally sabotage yourself. If you want to be successful in business, you form friendships and contacts with those who have similar goals rather than isolating yourself. Figure out how you may be sabotaging yourself and make changes at that level. Change your routine. Nothing undermines the good intentions to change a habit like boredom. While you’re working to kick bad habits, you can’t operate in a business as usual mode. You’ve got to find ways to ‘entertain’ and comfort yourself that are new and interesting. Small changes can break big habits. Chipping away at the bad habit can make a difference, given enough time. Ask yourself how you can make small changes that will have a significant impact on a bad habit you want to break. Set reasonable and doable goals. Bad habits can’t be replaced in a moment’s time. For example, if you need to get more exercise to improve your health, commit to small goals at first, such as moving for 10-minutes twice a day — walking or stretching. When that becomes a habit, take it to the next level – maybe a 20-minute workout. Breaking a bad habit takes work—consistency and patience—change will come. Focus on the desired result.